All Thg1 family members investigated so far catalyze an unprecedented reaction in biology: 3′-5′ addition of nucleotides to nucleic acid substrates. Thg1-catalyzed 3′-5′ addition can either be non-templated, adding G-1 opposite A73 of tRNAHis, or templated, adding Watson-Crick base paired nucleotides in the reverse (3′-5′) direction to that of all known DNA and RNA polymerases. 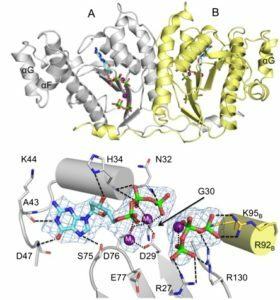 The recently determined crystal structure of Thg1 (obtained in collaboration with Dr. Sylvie Doublié, University of Vermont) was a remarkable surprise! Despite the lack of overall sequence similarity between Thg1 and other known enzymes, the structure indicated similarity between Thg1 and canonical DNA polymerases, and suggested that Thg1 similarly uses two-metal ion chemistry to catalyze reverse (3′-5′) polymerase activity. The ability of a similar active site to be used for both 5′-3′ and 3′-5′ addition activities raises questions about the origins of nucleotide addition enzymes, and the predominance of 5′-3′ nucleotide addition in modern biology. Investigation of the enzyme mechanism and biological function of Thg1 has the potential to uncover widespread roles for 3′-5′ nucleotide addition in all three domains of life. Our investigations of Thg1 enzymes from bacteria and archaea demonstrates that yeast Thg1 is merely the founding member of a family of highly conserved enzymes found in all three domains of life, whose biological functions reach far and beyond the known essential role of yeast Thg1 in tRNAHis maturation into RNA (and potentially DNA) repair and editing. These unusual and unexpected roles for Thg1 family enzymes are the focus of much of our current work on Thg1.